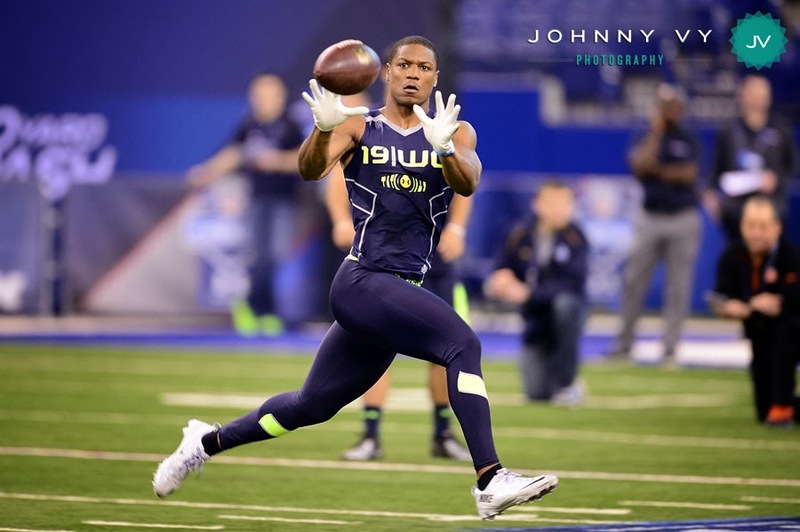 For more photos, including some behind-the-scenes images from the Combine, check out my Instagram feed. 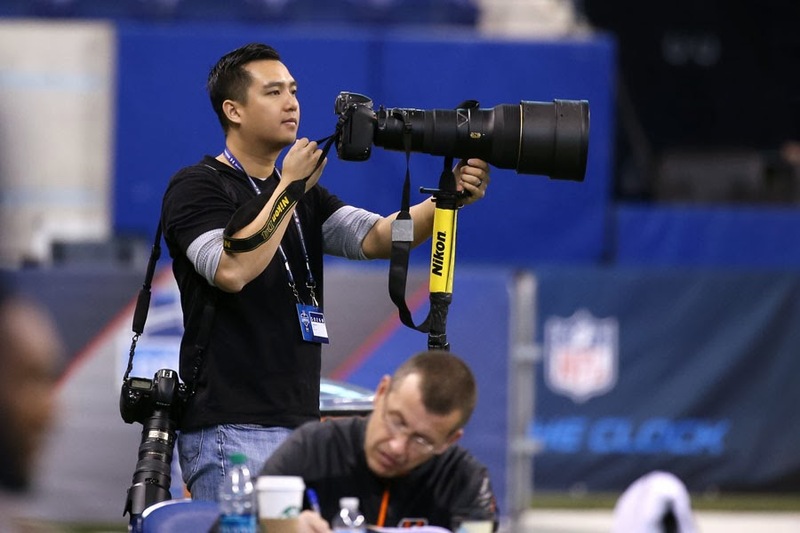 If you asked me early in my career what my dream job in sports would be, I would say it is to travel around with a team as their official photographer (it still is). I have always enjoyed going around to different cities, living out of hotels, and exploring a city other than the one that I grew up in. I am not one who gets out much, and I do enjoy getting assignments away from home. Most people who travel around a lot tell me that it's difficult to have a family life at home, and I find it extremely ironic that I only recently started getting travel assignments for work once I got married and began starting a family of my own with a son on the way. I'll take it though. 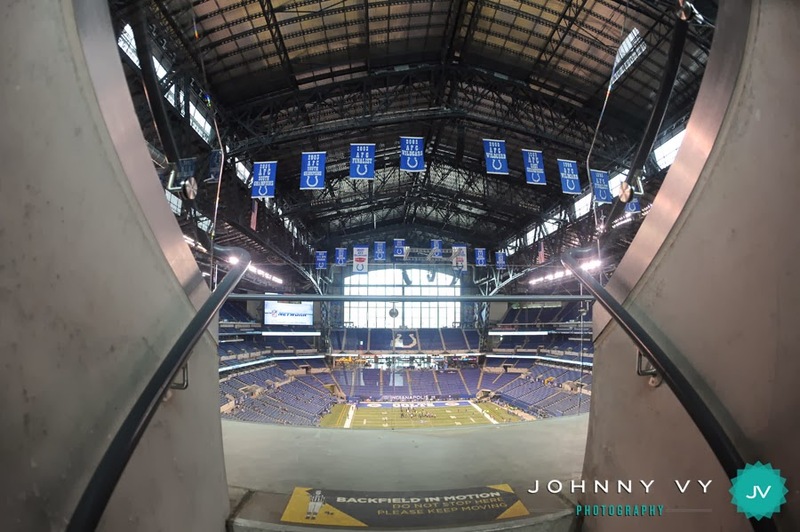 The Indianapolis city skyline, as seen from the top seats of Lucas Oil Stadium. 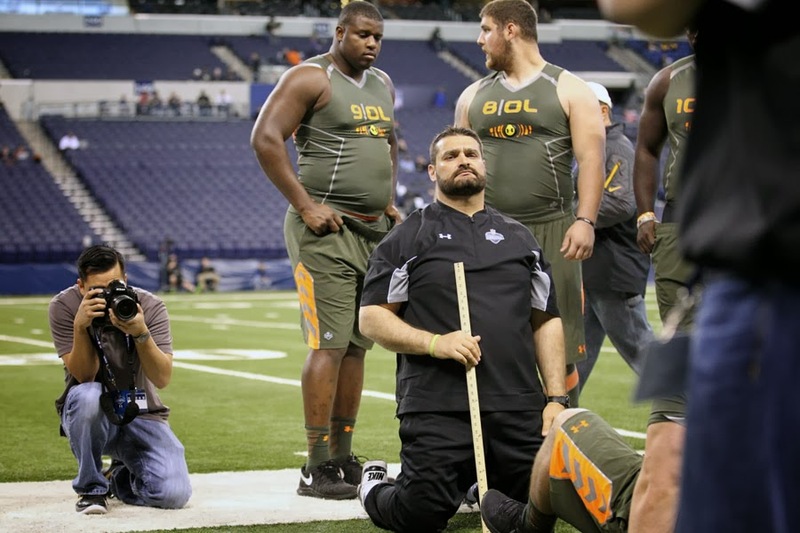 In January, I was sent to the Senior Bowl in Mobile, Alabama. 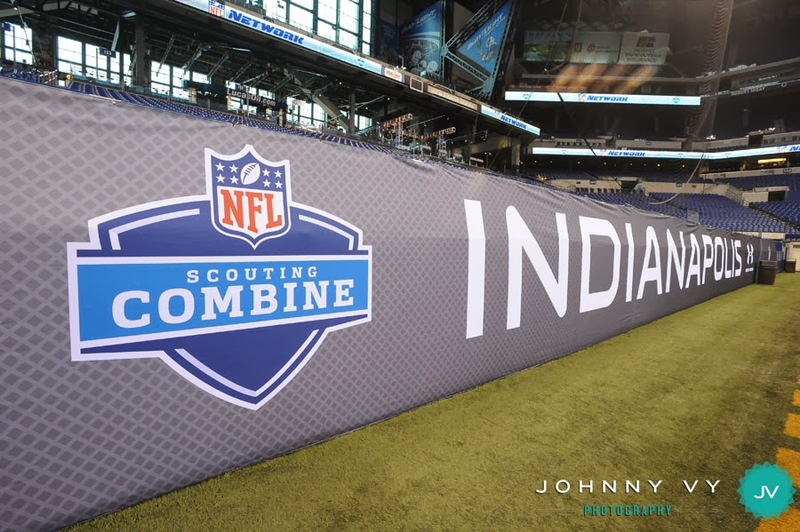 This month, I was once again sent to the NFL Scouting Combine in Indianapolis. I did this same trip last year, but had to cut my trip short. 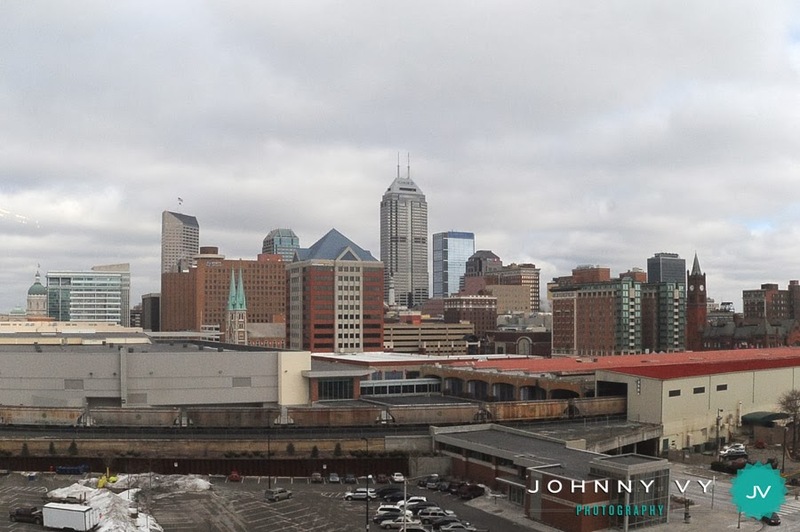 Last year when I landed in Indiana, the temperature was 17 degrees F. It was cold. 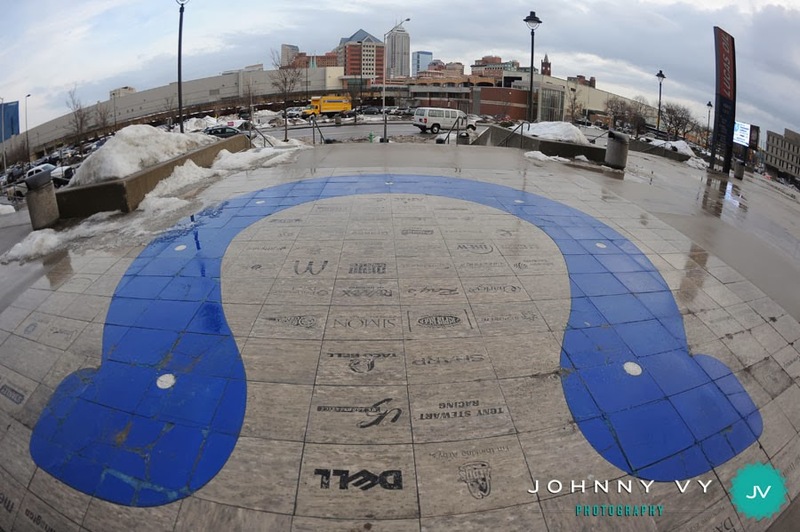 This year, the week was relatively cold, but not overbearing. 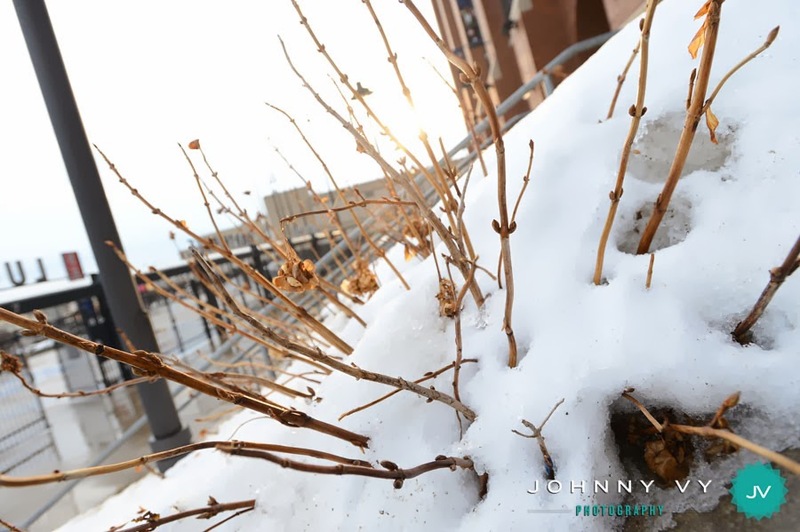 When we landed, there was already snow on the ground from the polar vortex the east had experienced a few weeks ago. There were no snow flurries until the 6th day of the Combine, and we had great weather the second and third days and highs in the 50's, and lows in the 20's. We lucked out this year and flew home a day before temps would dip below 10 degrees. 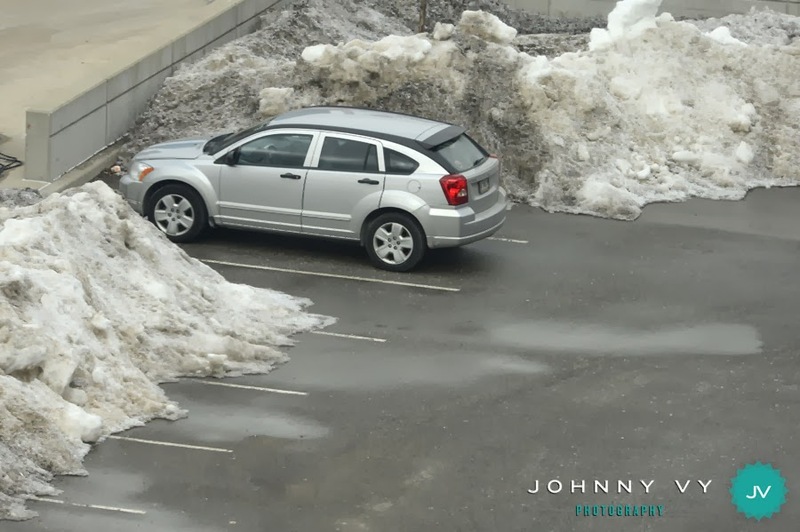 Here's one way to guarantee nobody dings your car - shovel out a single parking space for yourself. This is one smart person. 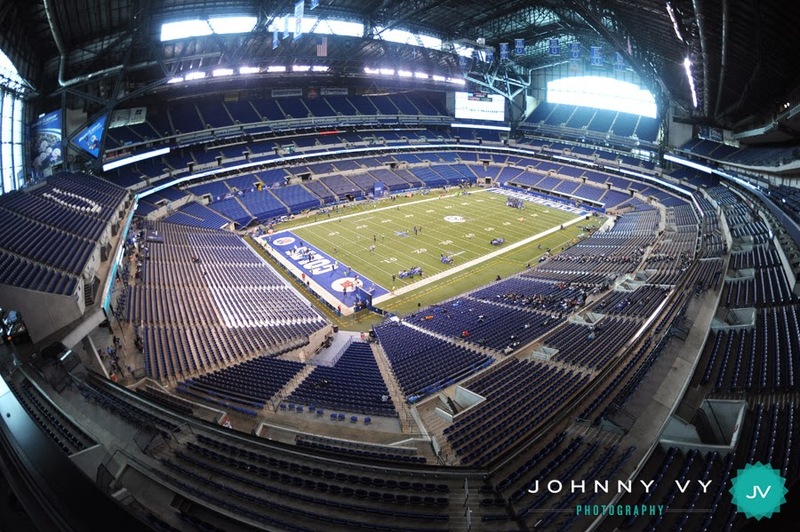 To give you an idea of what the NFL Scouting Combine is like, all the teams come to one city to evaluate the talent in this year's draft class. 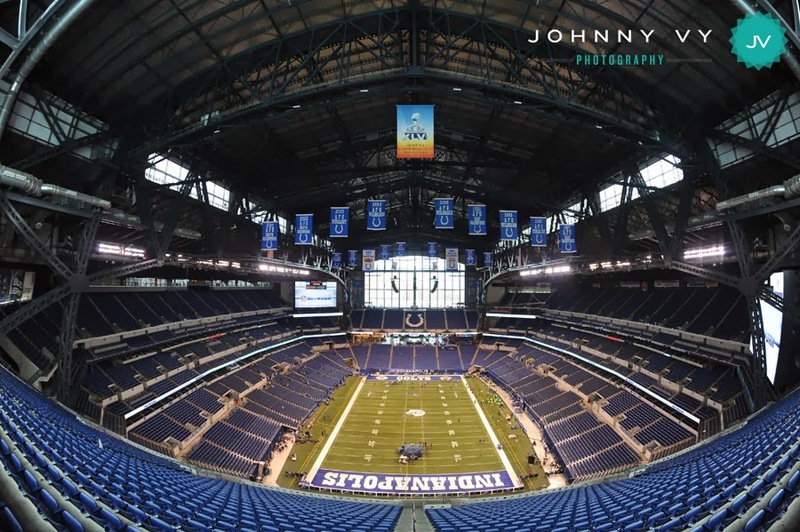 It is much easier to have a centralized location for everybody to go to, instead of players and scouts flying around the country to see each other. 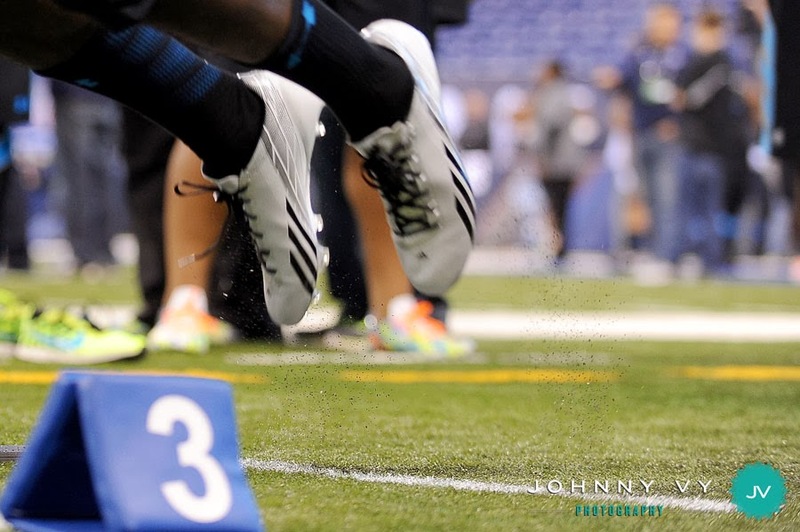 About 300 players are in town to be measured, tested, and run through drills designed to expose their weaknesses. 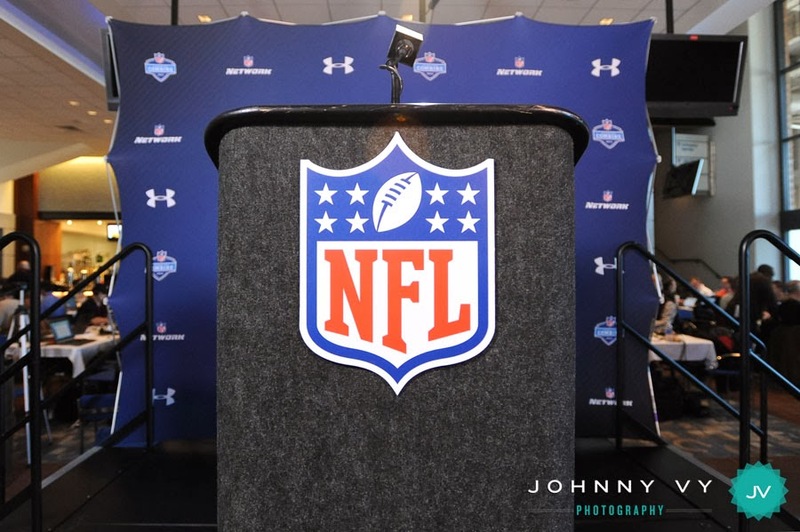 Drafting a prospect is a big business, and with the amount of money teams will be investing in their players, it is important to get all the details - the intangibles that you don't see from watching tape. 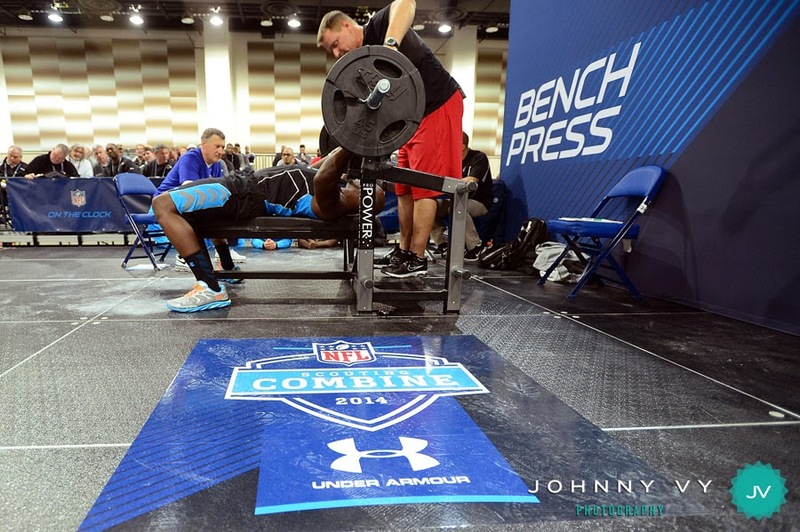 We all know what a great Combine performance can do for an NFL prospect. 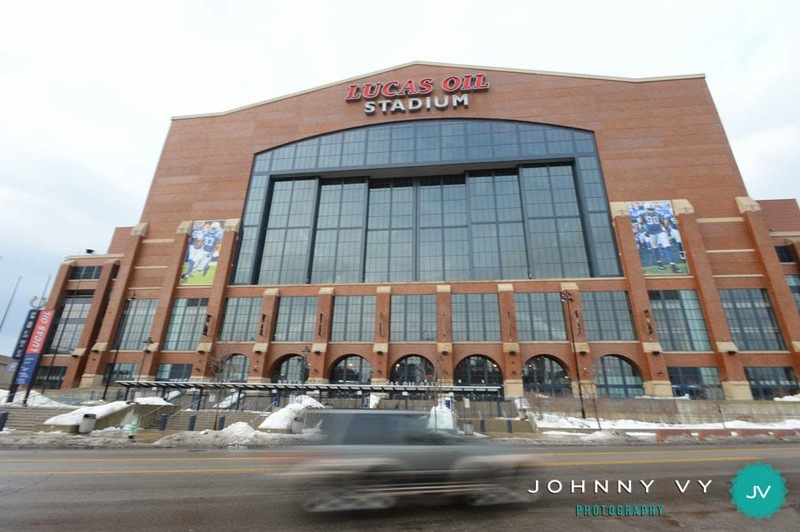 With that in mind, these young players came to Indianapolis with a business-first mentality. 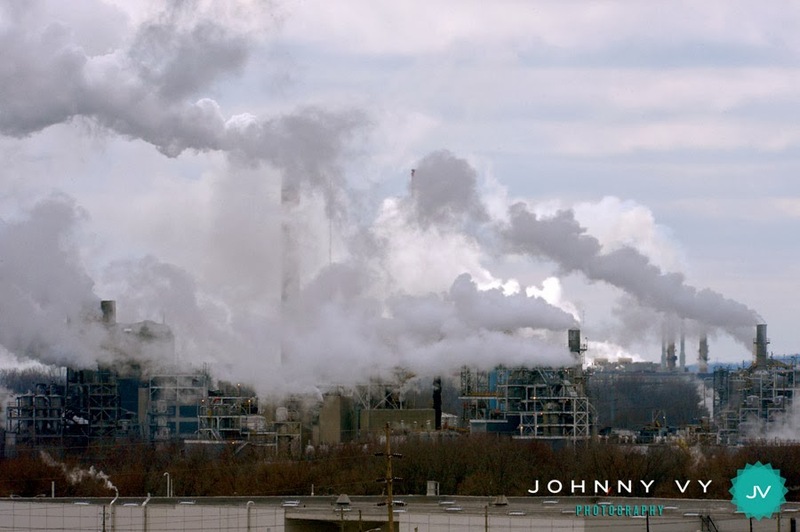 This was a job interview, and one of the most scrutinizing interviews anybody would ever go through. 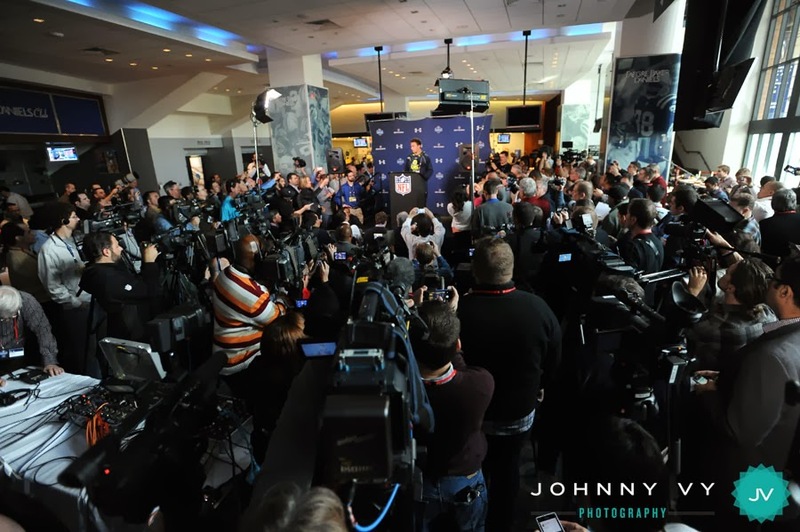 The first two days were spent in the media area photographing interviews with coaches, general managers, and players. 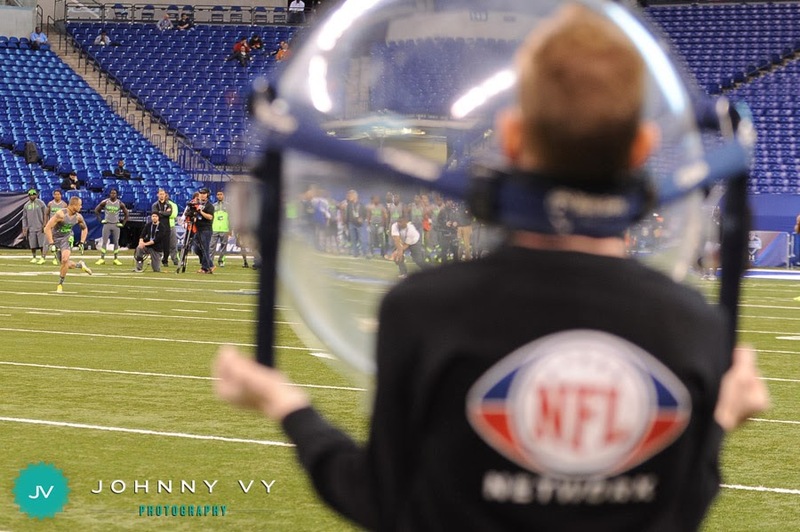 I sat at a table with NFL.com's Around the League team of Gregg Rosenthal, Marc Sessler, Dan Parr, Chris Wesserling, and Chase Goodbread. 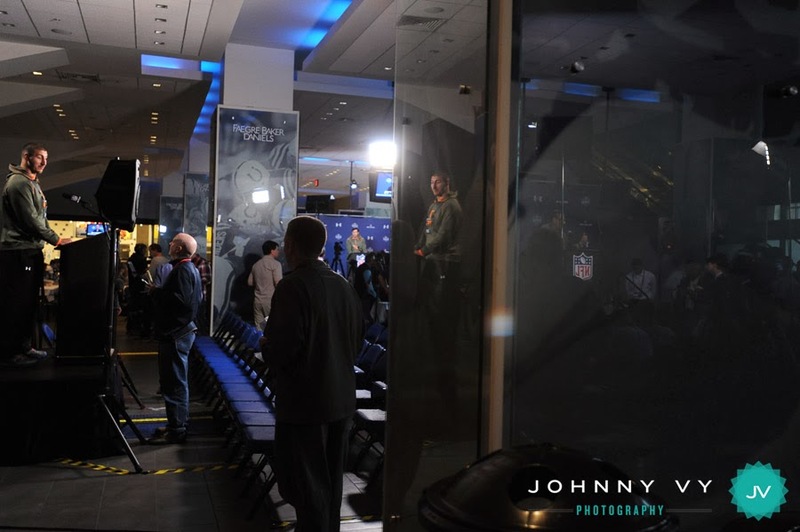 There are three main podiums in the media room scattered around, and a bunch of tables where the smaller-named players would sit and speak to reporters. Last year, the big story was Manti Te'o and the catfish story. 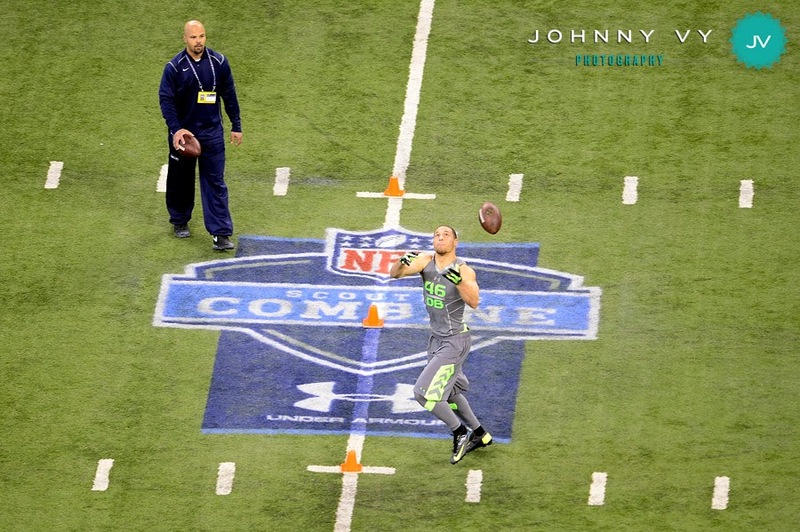 This year provided bigger names all around in every category, including Texas A&M's Johnny Manziel. 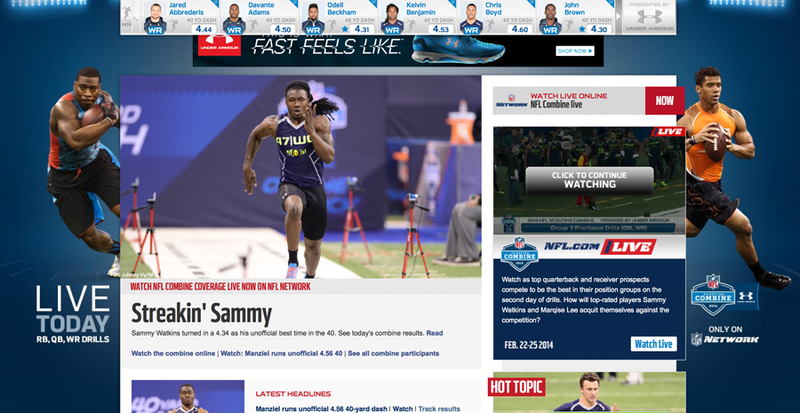 The other big story was Missouri's Michael Sam coming out as the first openly gay athlete trying to make an NFL team. The media scrum would be large for each of these guys. Obstacles like tripods and chairs can sometimes make it difficult to get the best angle. 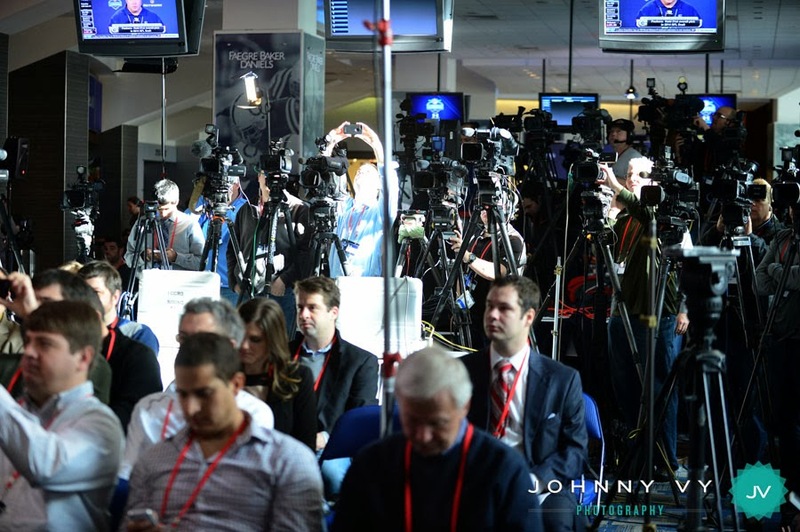 Over the course of 2 days, I believe I shot over 80 press conferences. I like doing the pressers because once I get my standard shot of the talking head against a backdrop, I can move around and try to change up the angles and get creative. 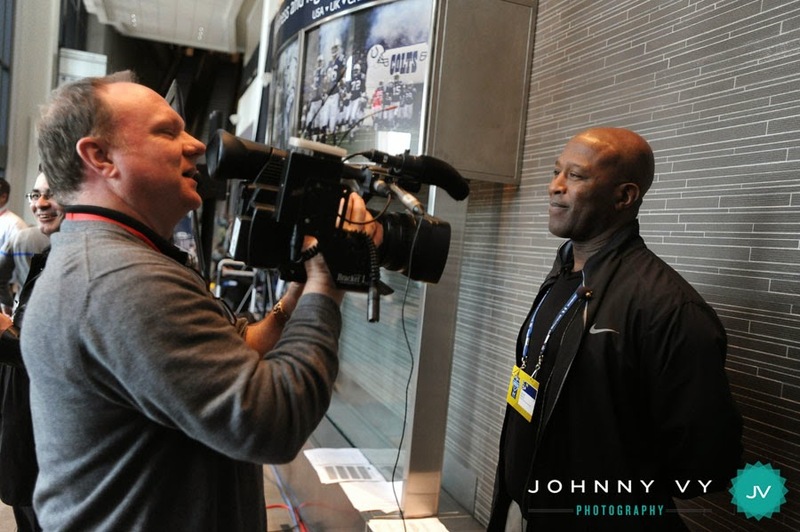 Tampa Bay Buccaneers head coach Lovie Smith is interviewed. 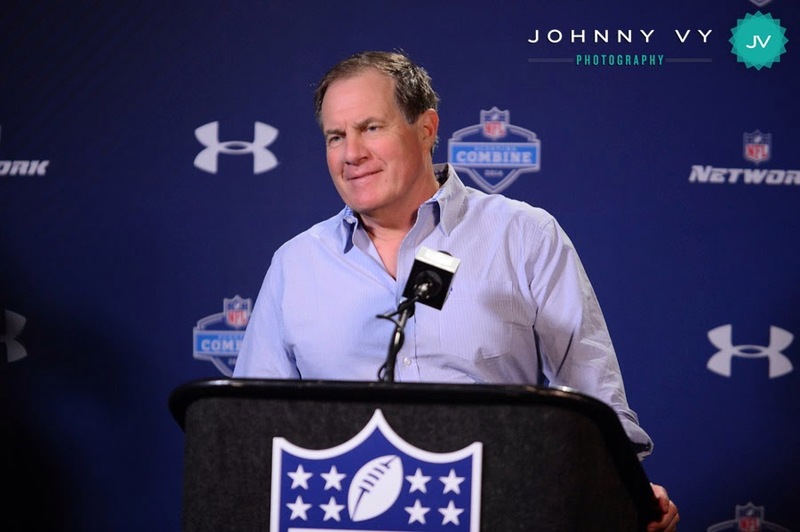 New England Patriots head coach Bill Belichick smiles! 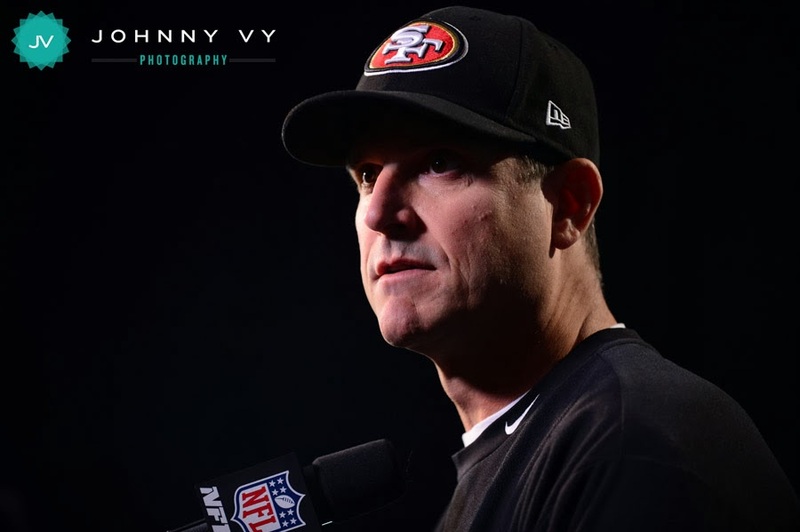 San Francisco 49ers head coach Jim Harbaugh speaks to the media. 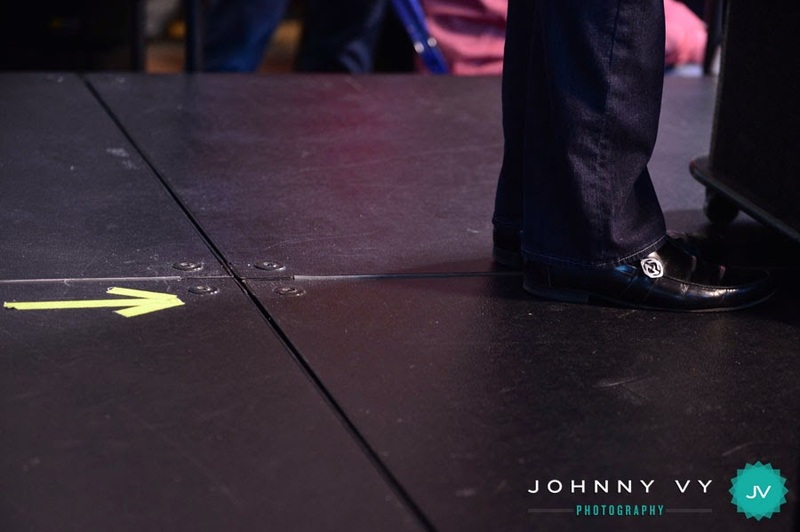 Looks like Harbaugh never ditched his beloved pleated khakis after all. 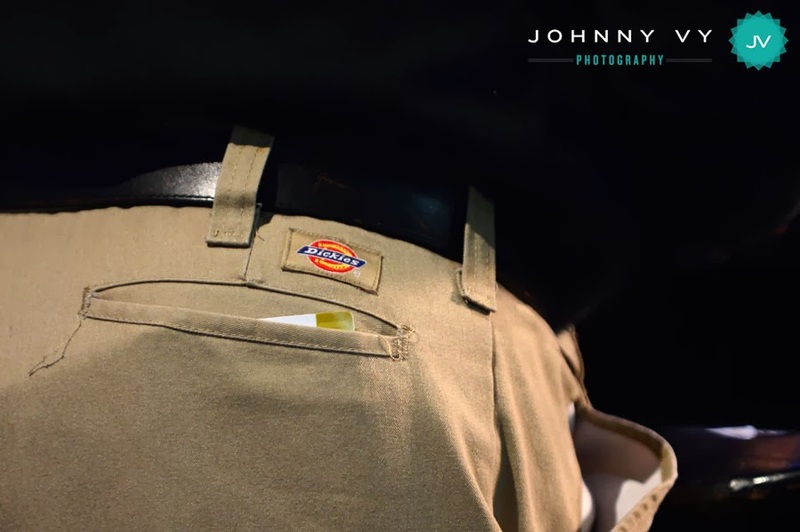 For more on Jim Harbaugh's infamous khakis, read this. 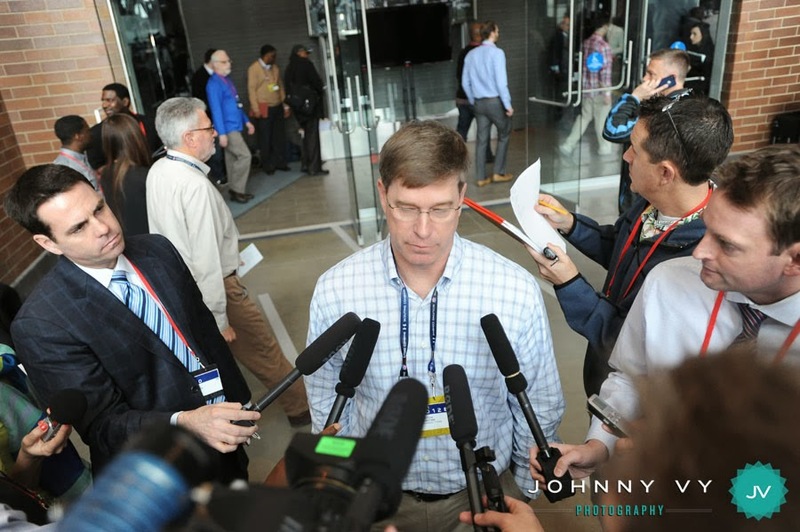 Chicago Bears general manager Phil Emery speaks to the media at the 2014 NFL Scouting Combine. University of Iowa tight end C.J. Fiedorowicz at the podium, and in the reflected podium. The first press conference of the week. 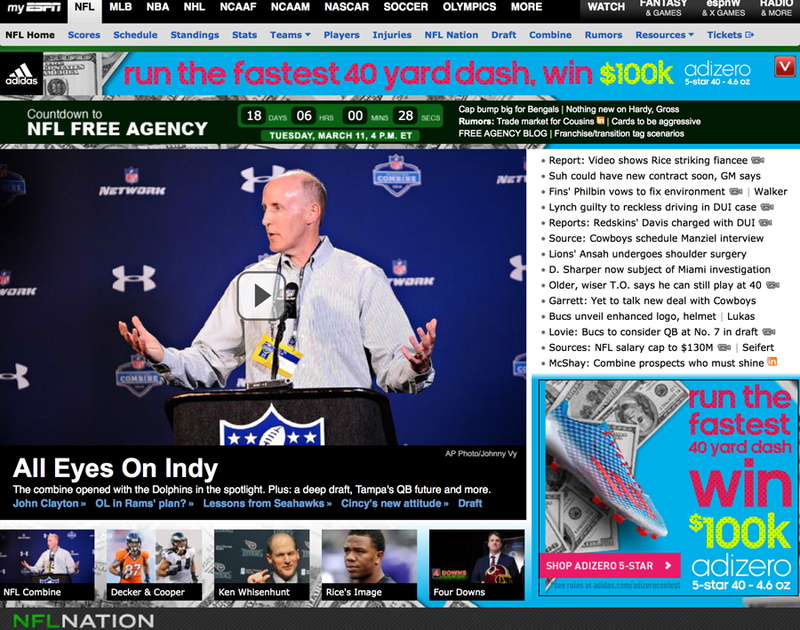 Miami Dolphins head coach Joe Philbin addresses the Jonathan Martin/Richie Incognito situation head on. 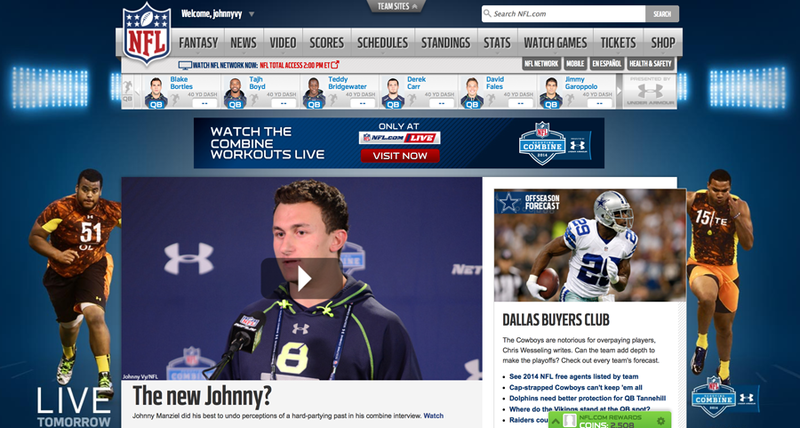 Texas A&M quarterback Johnny Manziel faces the press. 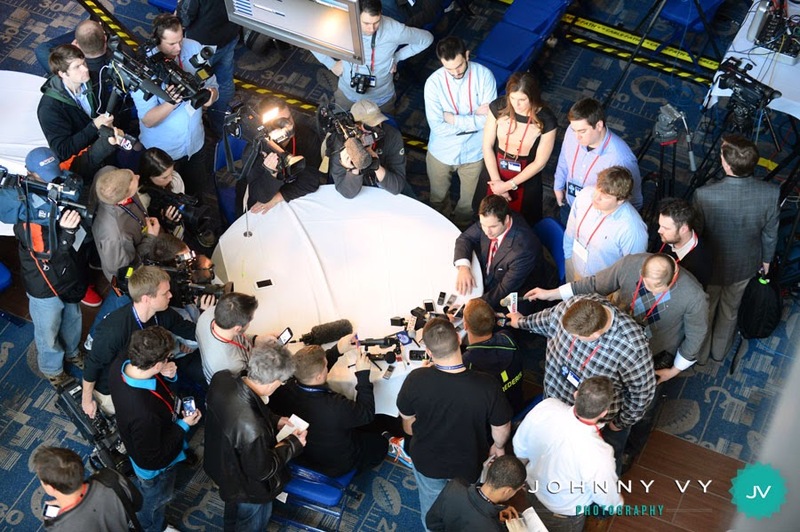 University of Wisconsin wide receiver Jared Abbrederis answers a round of questions from a round table of media. 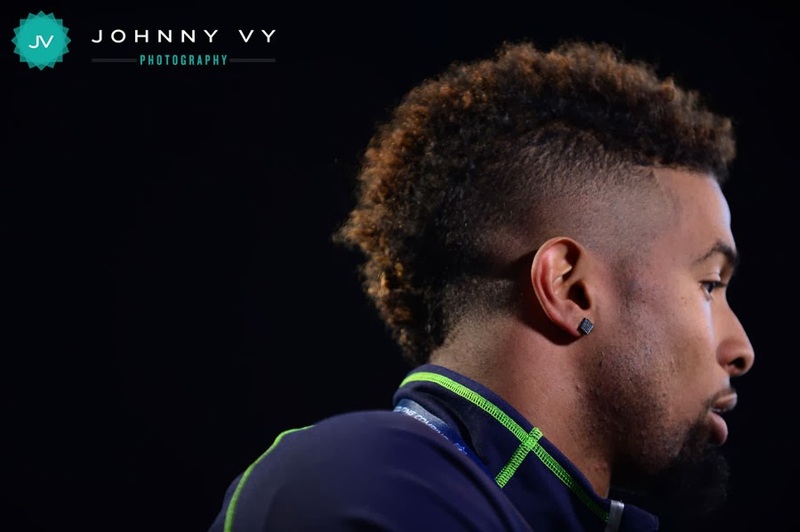 Louisiana State University wide receiver Odell Beckham, and his hair. This man needs no introduction. 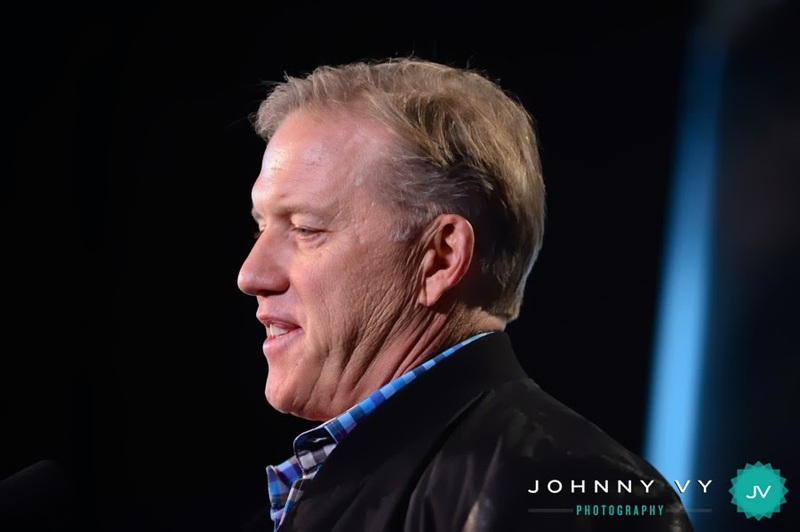 The one and only, John Elway. 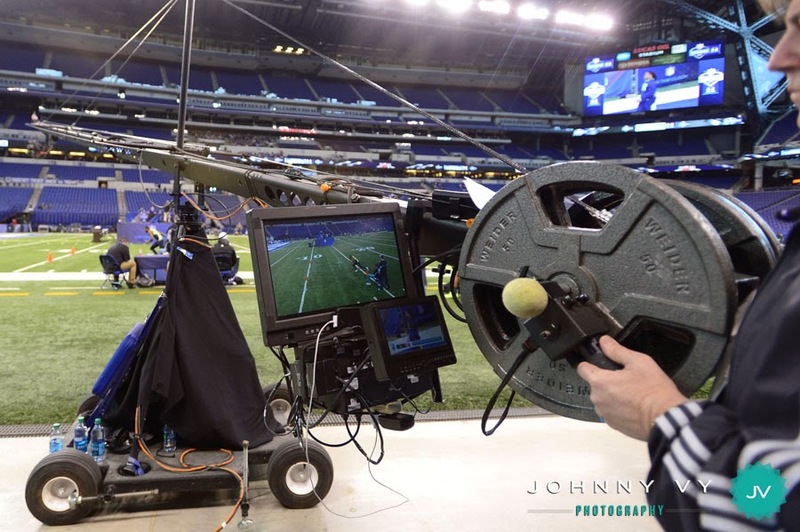 Sometimes it does get hard to move around depending on how large the media scrum is, but overall, I was glad to get out of the media room after two days, and finally start shooting some action on the field. 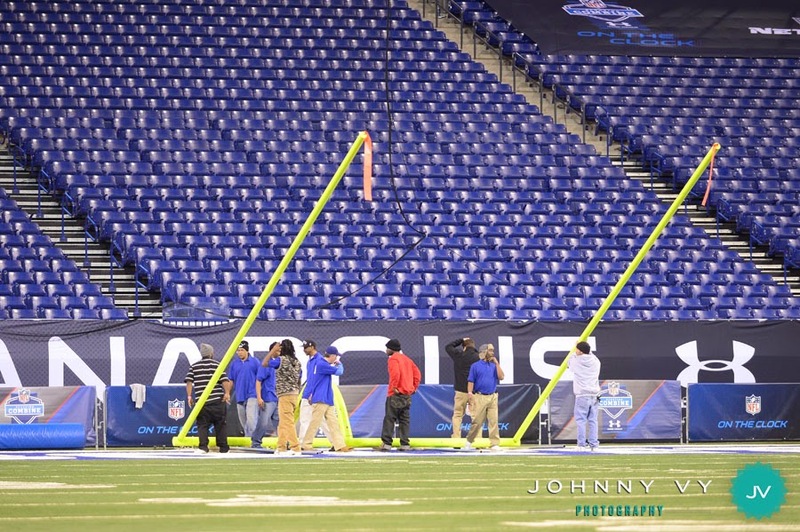 The field goal post comes down to make room on the field. 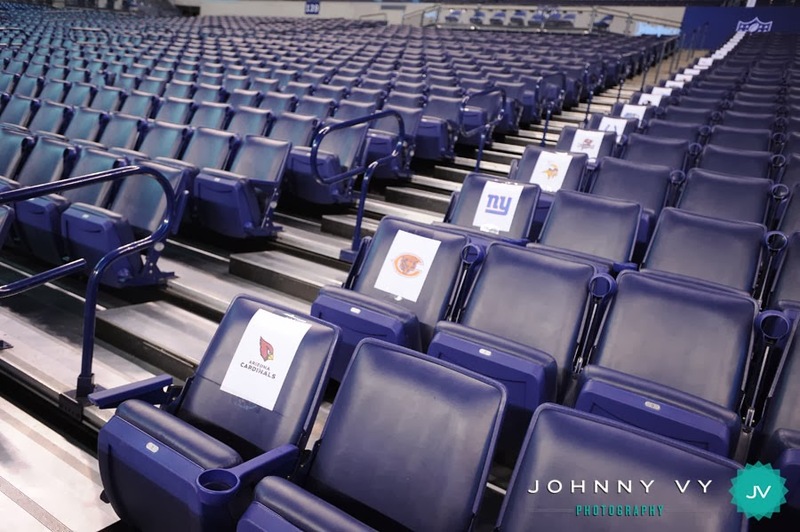 Seating for team scouts along the 40 yard line. 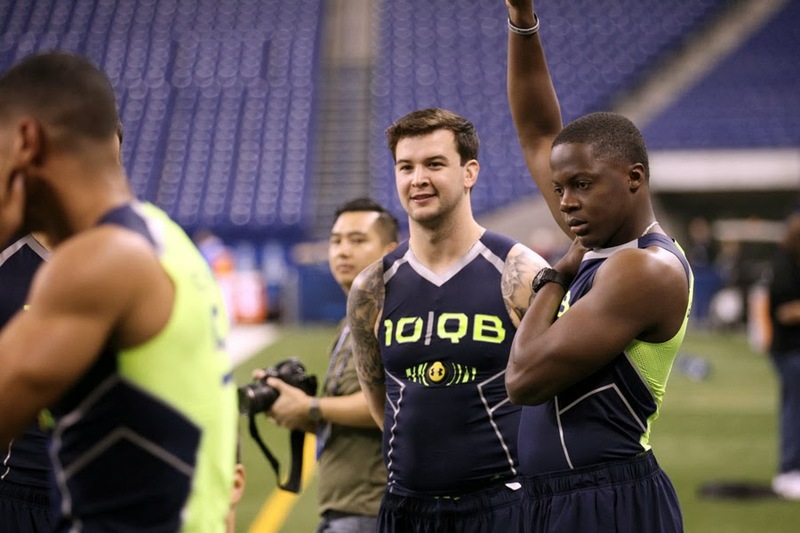 Michigan's Taylor Lewan shows us his core workout with a medecine ball for NFL Up! 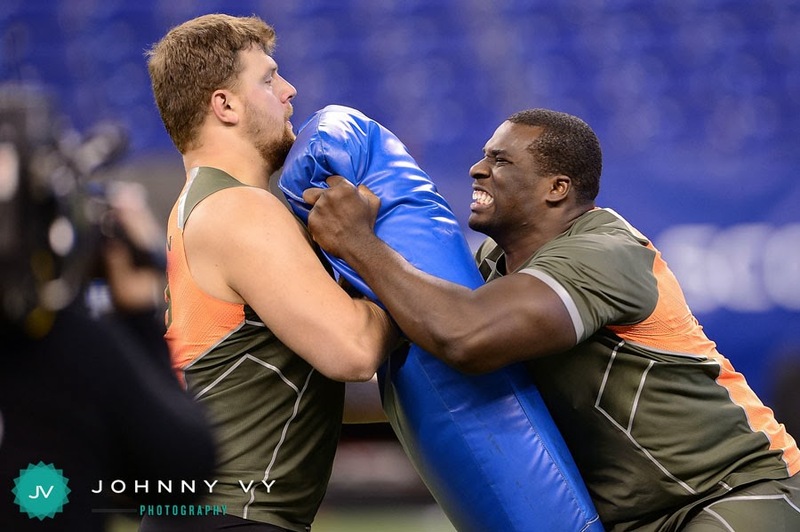 University of Alabama offensive tackle Cyrus Kouandjio putting in work. 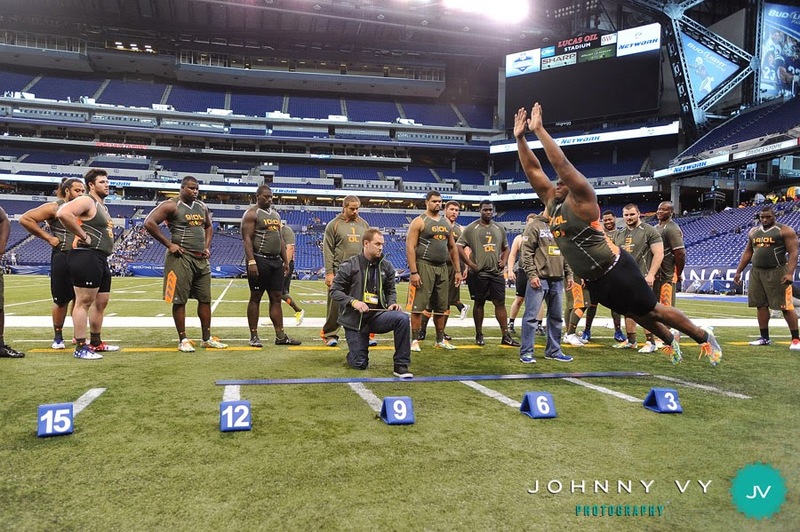 Mississippi State offensive guard Gabe Jackson performs the broad jump. That's one big boy. Tight ends having their reach measured. 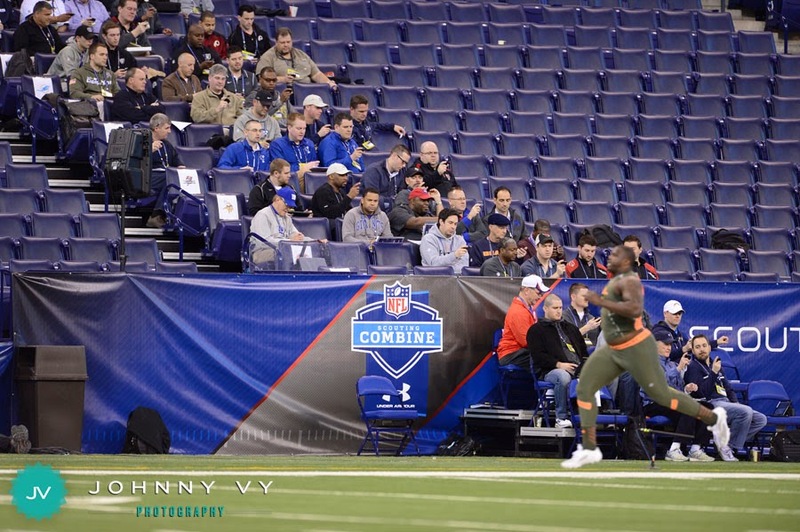 Scouts look on during the 40-yard dash. 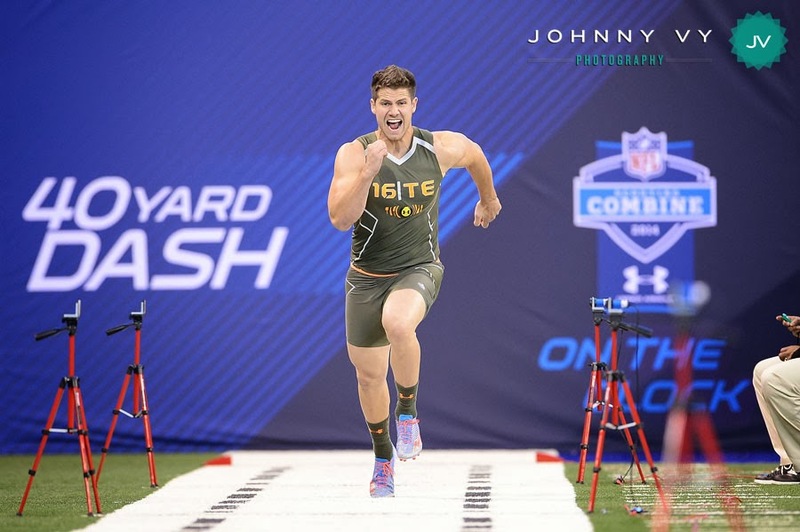 University of Utah tight end Jake Murphy runs the 40-yard dash. 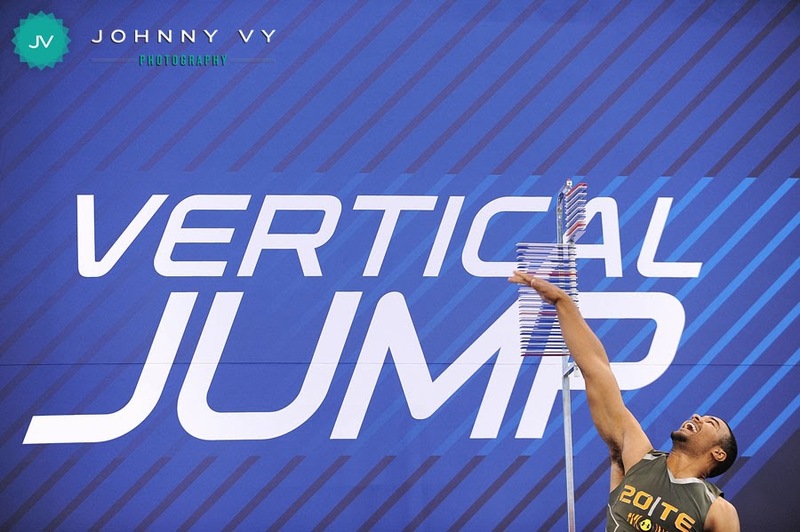 University of California tight end Richard Rodgers performs the vertical jump. 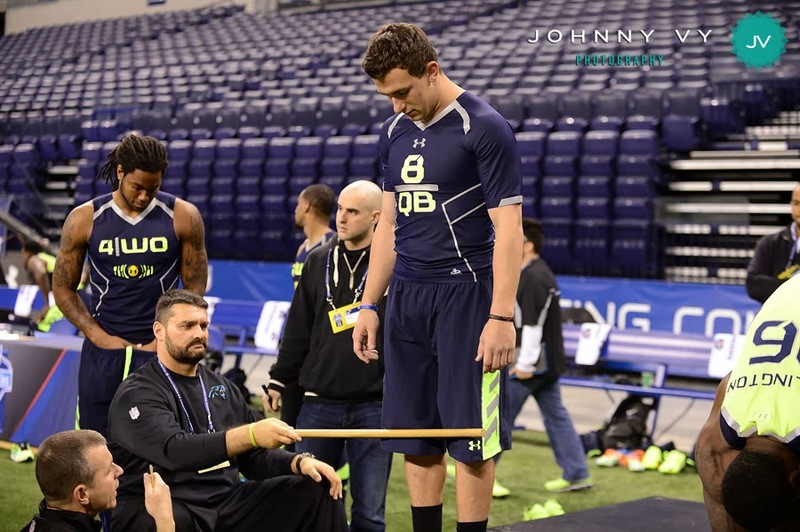 Texas A&M University quarterback Johnny Manziel is measured. 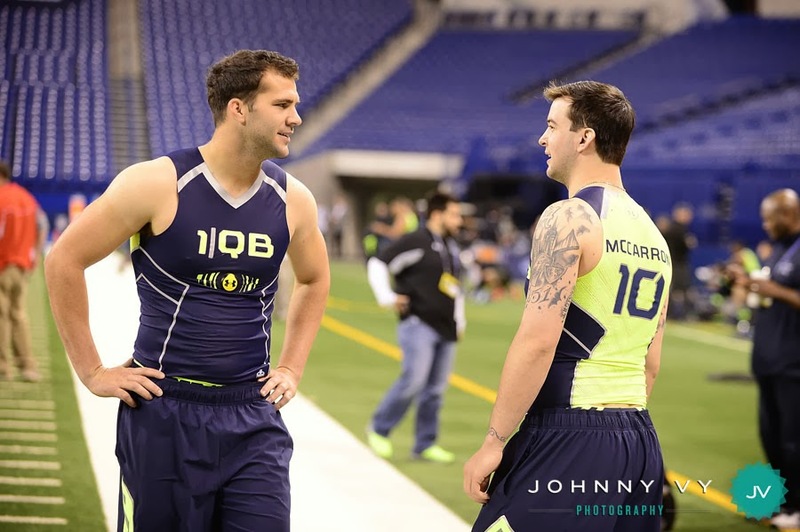 University of Central Florida quarterback Blake Bortles and University of Alabama quarterback AJ McCarron speak to each other before running through their drills. 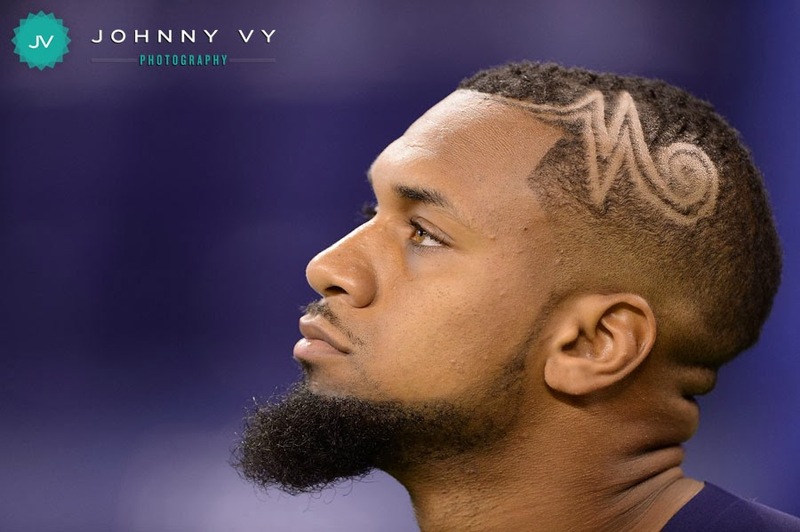 University of Mississippi wide receiver Donte Moncrief looks on. UCLA wide receiver Shaq Evans doing what he does - catching passes. 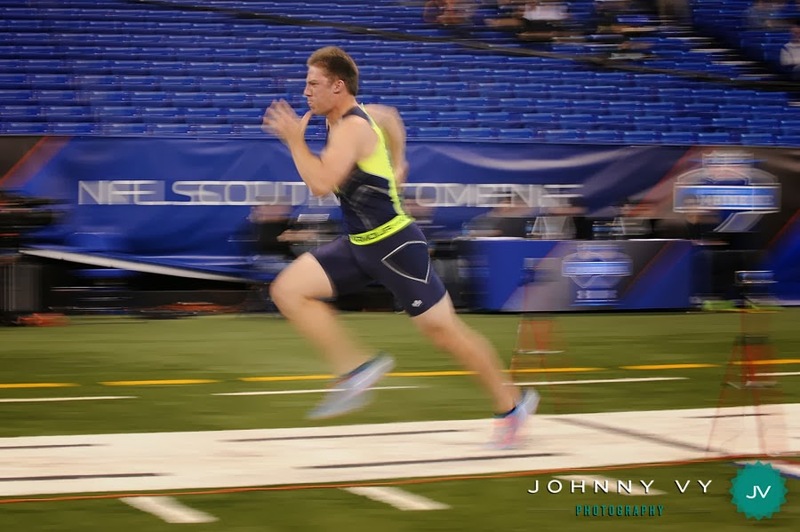 University of North Carolina quarterback Bryn Renner runs the 40-yard dash. 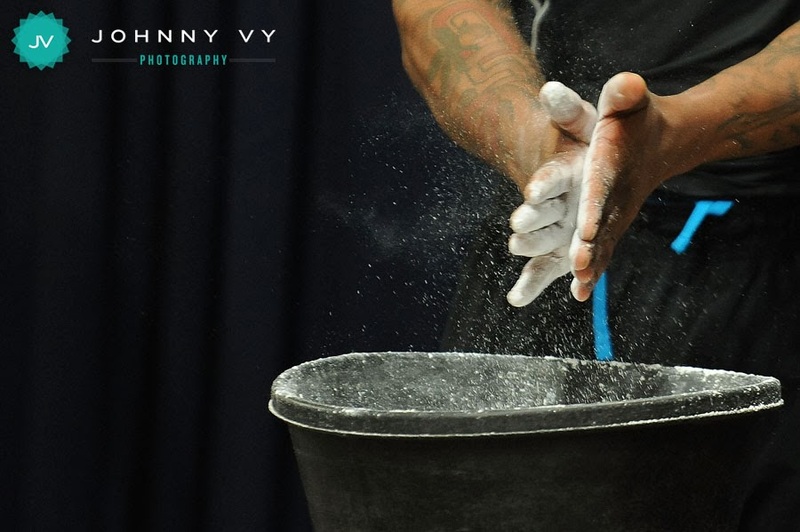 Ball State University defensive end Jonathan Newsome applies chalk to his hands before performing the bench press. 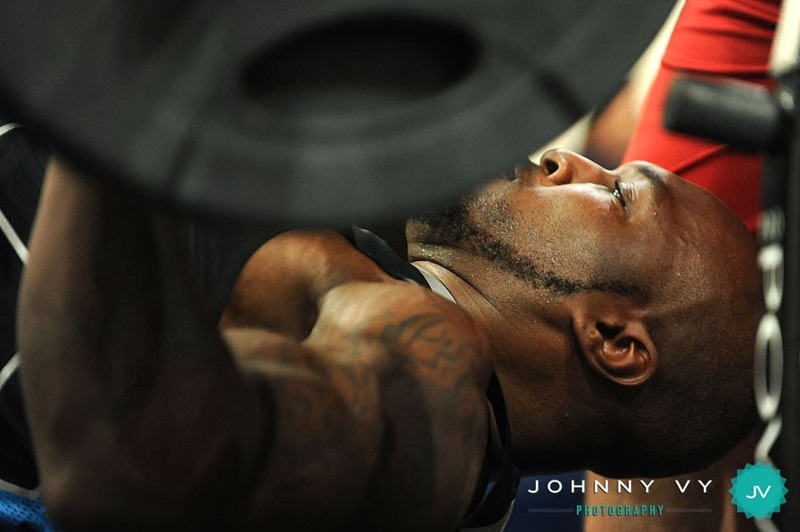 Concordia University-St. Paul defensive end Zach Moore shows how it's done on the bench press. 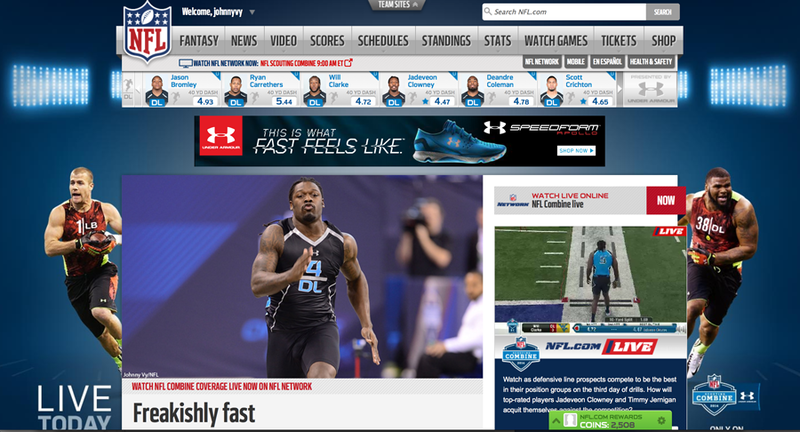 Check out this vicious hit from South Carolina's Jadeveon Clowney, and picture him running right at you. Jadeveon Clowney is highly regarded as the best player in this year's draft class, and could possibly go number one overall. 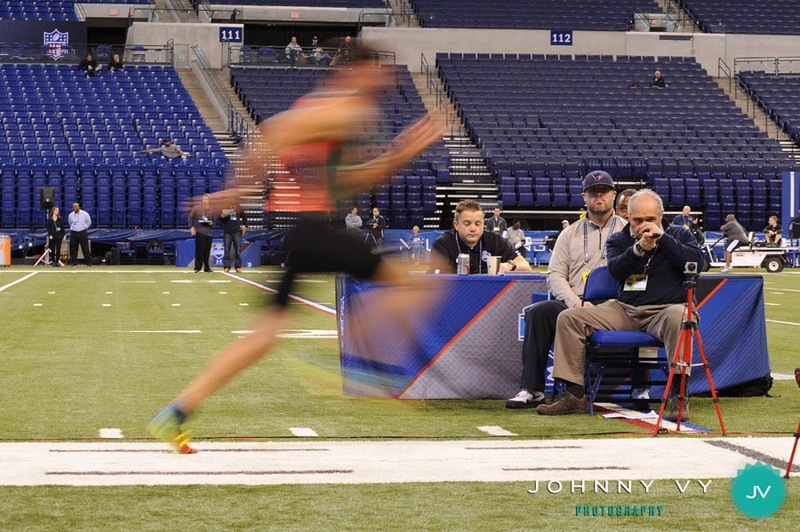 Before he got up off the bench to run the 40-yard dash, I heard another player call him back and say, "Hey, go show em. Leave no doubt." Surely he did just that. The defensive linemen huddle together before warming up. 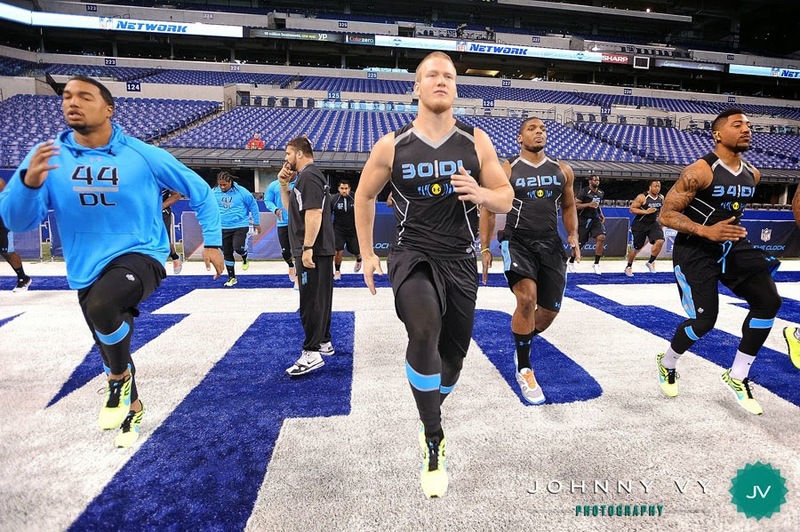 University of Louisville defensive end Marcus Smith, Stanford University defensive end Josh Mauro, University of Missouri defensive end Michael Sam, and Ball State University defensive end Jonathan Newsome warm up before performing drills. 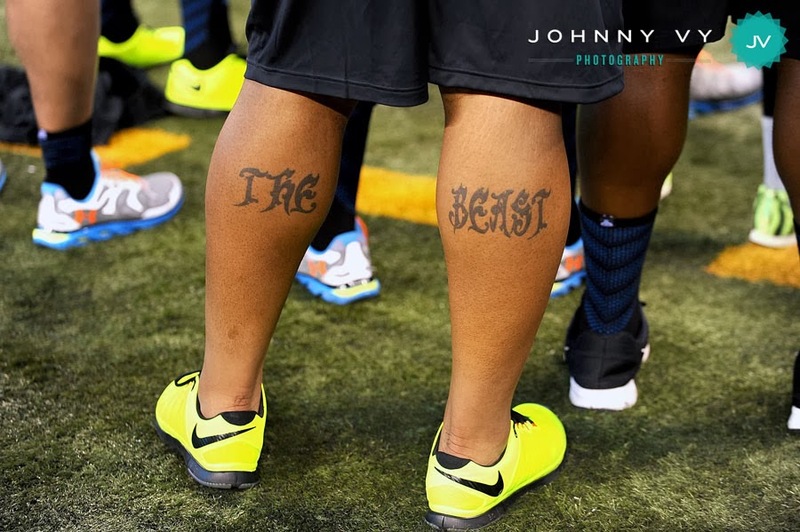 Colorado State University-Pueblo defensive tackle Mike Pennel's tattoo. 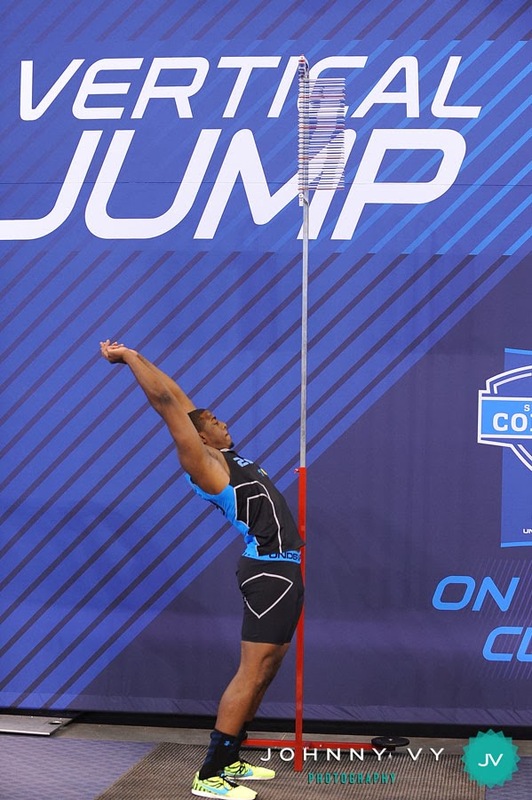 University of North Carolina defensive end Kareem Martin stretches before the vertical jump. He's got some ups. 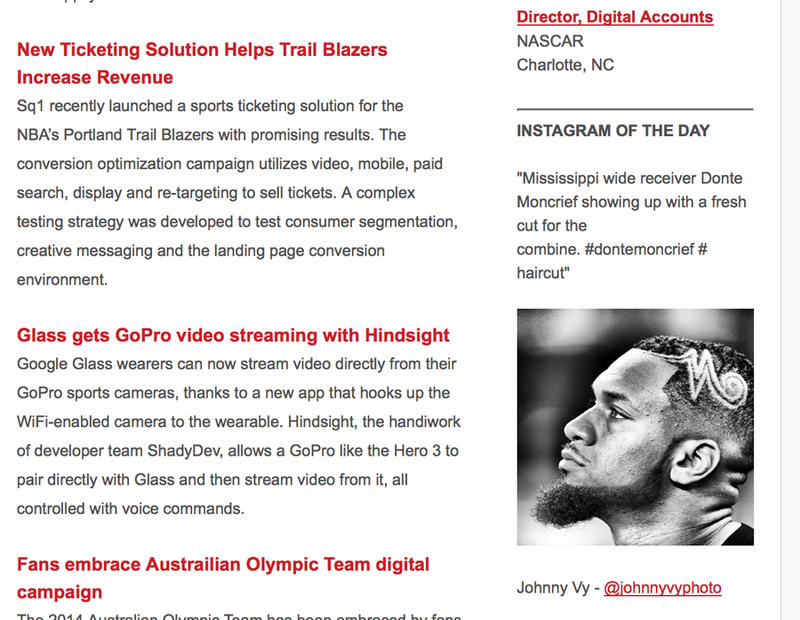 I got a nice mention from Hashtag Sports of my shot of Donte Moncrief. 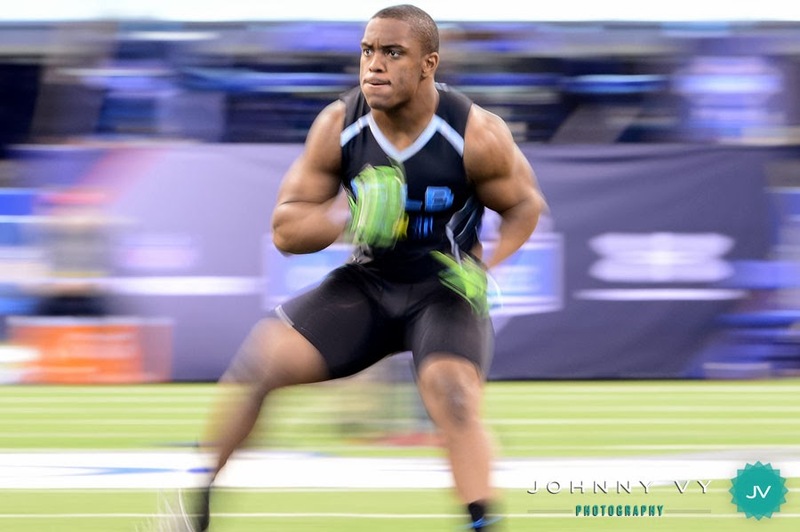 University of Southern California linebacker Devon Kennard. 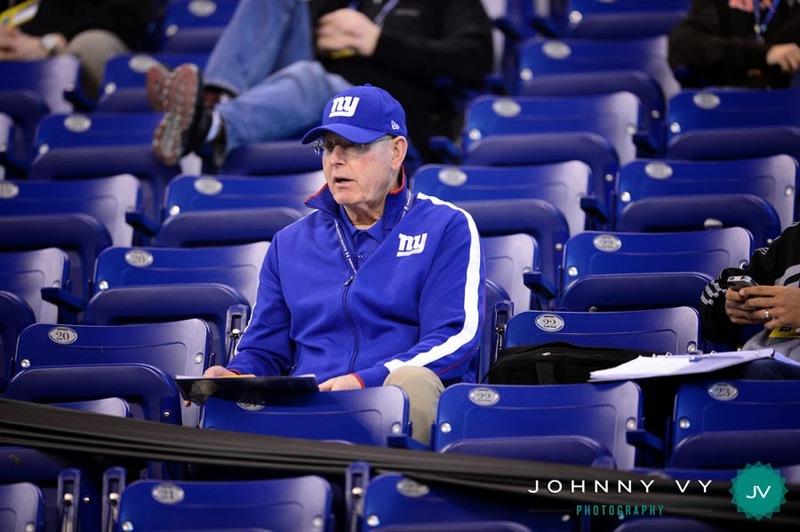 New York Giants head coach Tom Coughlin looks on from the stands. 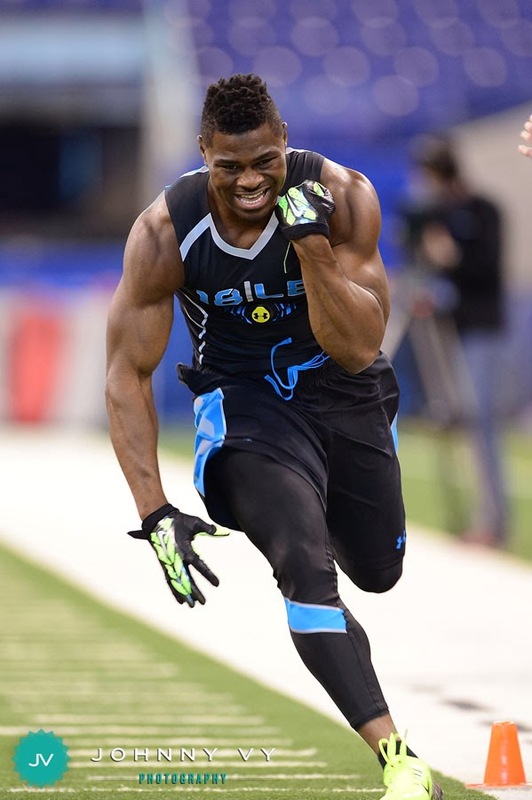 University of Buffalo linebacker Khalil Mack reacts after dropping a pass during a drill. 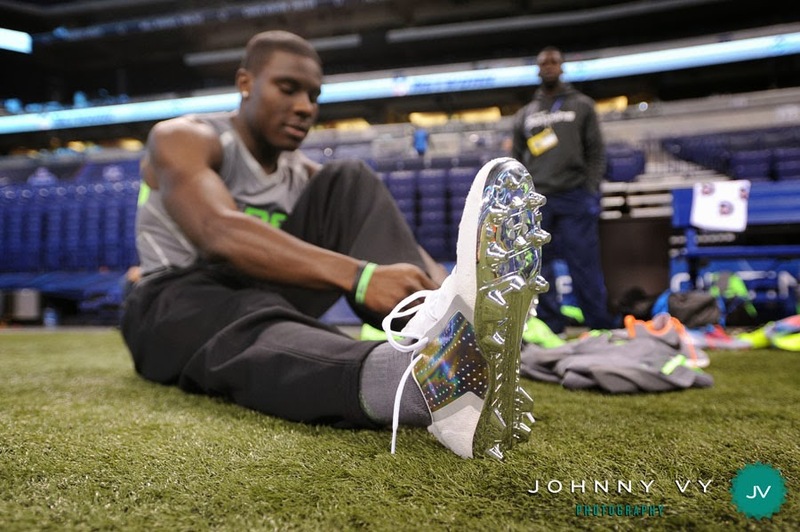 University of Southern California strong safety Dion Bailey laces up his cleats before drills. 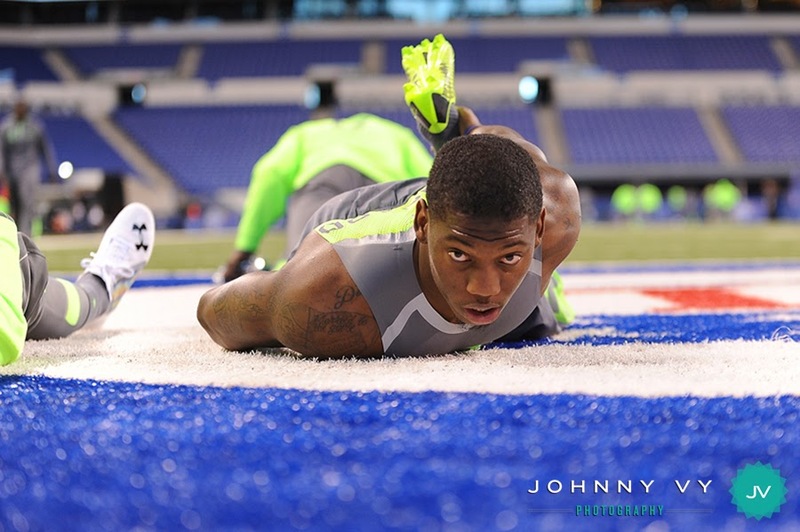 Michigan State University cornerback Darqueze Dennard stretches before running the 40-yard dash. 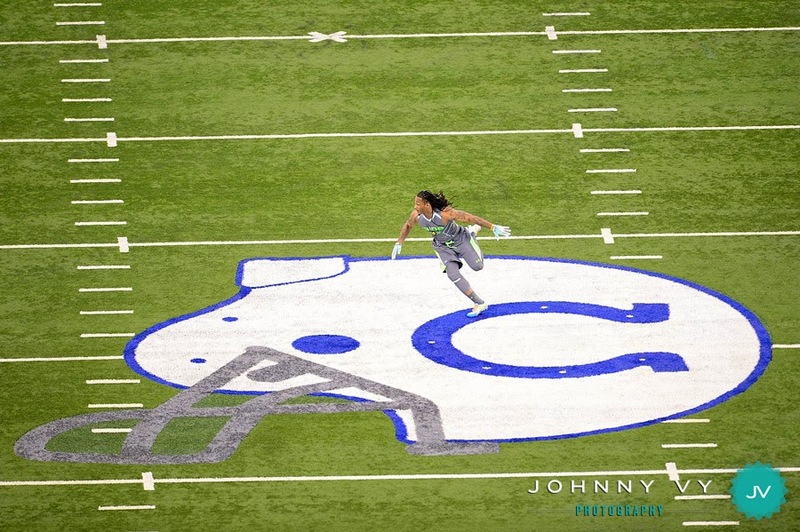 Duke University cornerback Ross Cockrell. I look at this, and I see the Under Armour logo somehow. Trekking up these stands for this photo is no joke. Talk about a stair workout! University of Stanford free safety Ed Reynolds bobbles a pass. Rich Eisen sheds some weight (i.e. 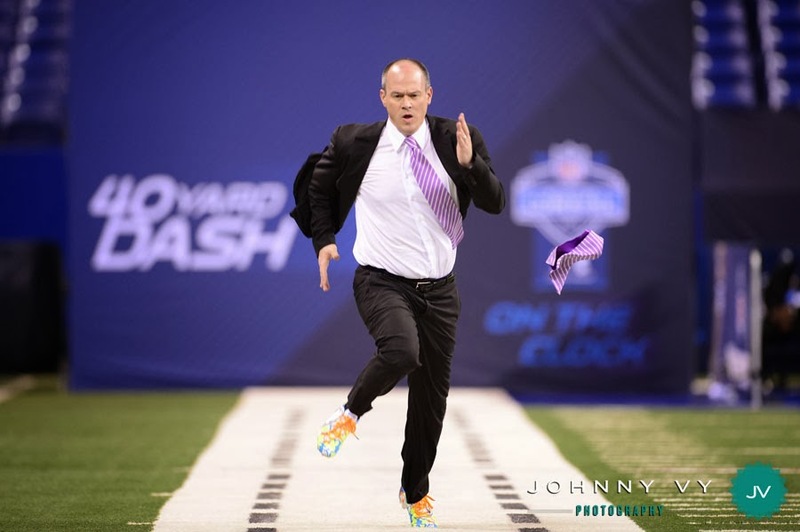 loses his pocket square) and runs a 5.98 second 40-yard-dash. His best time in 10 years. Hope you liked the pics! 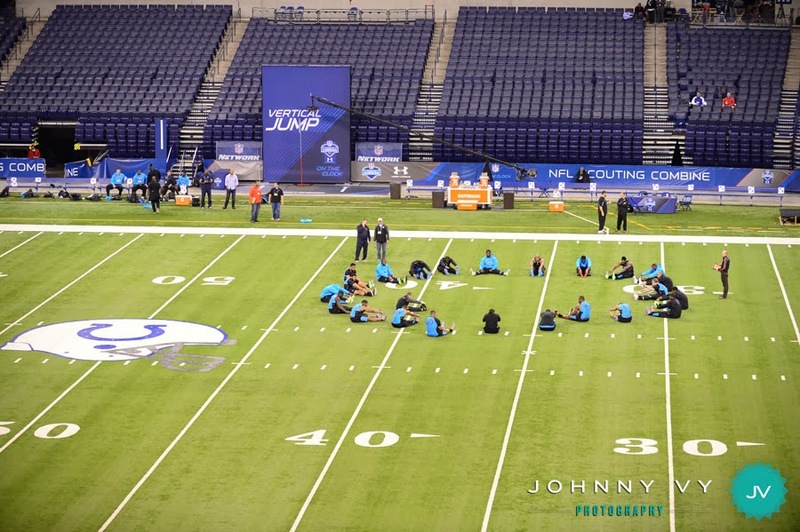 For even more photos, check out NFL.com's gallery of the 2014 Scouting Combine, and their Top 10 photos gallery. Until next year!